“Barkat, visible in his white shirt, marches in from the right with his security team. Guns drawn, the bodyguards on both sides of Barkat order the Palestinian man to drop his knife, which he does. “The video then shows Barkat lunging at the attacker and bringing him down with the help of his bodyguards. “The mayor then approaches the victim, who can be seen standing in the intersection, and sits him down on the sidewalk. “The assailant was an 18-year-old Palestinian who was residing illegally in Israel. “Barkat told Channel 2 he was on the way to the municipality headquarters for a meeting when he saw the attack unfold. 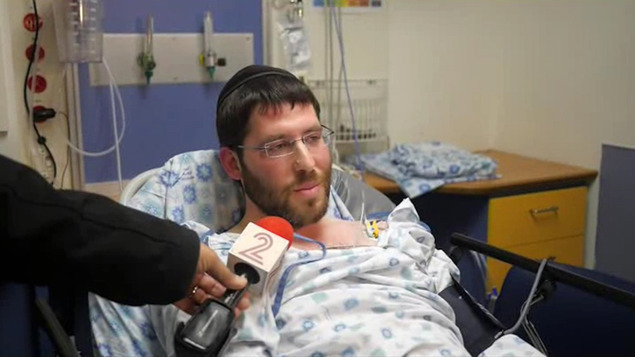 Late Sunday night, Barkat visited Goldshmidt in his hospital room at Shaarei Tsedek Medical Center. Goldshmidt told the mayor,”I want to thank you from the bottom of my heart. What you did was a humane act,” as he thanked him over and over while shaking his hand. 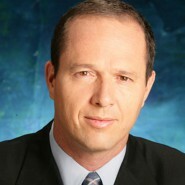 Wow, Nir Barkat, I am proud to have you as my mayor! (You can see Barkat in the footage of the attack…he is the one wearing a white shirt).